Lumitusi is proud to present the Galaxy Elephant - a part of the Galaxy Star projection night light series. The Elephant is an extraordinary night light companion, gently transforming your child's nursery or bedroom into a starry sanctuary. Projecting soft star patterns onto the walls and ceilings, the Elephant induces a calm and comforting environment, and is a terrific aid to those who are just learning to sleep by themselves, or are too afraid to sleep in the dark. Battery operated and touch-activated, the Elephant comes with 3 static colour settings - Orange, Blue, and Green - and an auto colour cycling mode that gradually transitions through all the colours. A built-in 45 minute auto-off timer on light and 10 or 20 minutes selection on the Lullaby helps conserve battery life. Designed with child safety in mind, the body is made from an ROHS-compliant (lead-free) high impact plastic, with a surface that is easily cleaned and offers a more hygienic alternative to other fabric type soft toy night lights. In addition, the battery compartment hatch is screw-fastened, preventing accidental access. Please see our other Galaxy and Sea World series projection night light products! 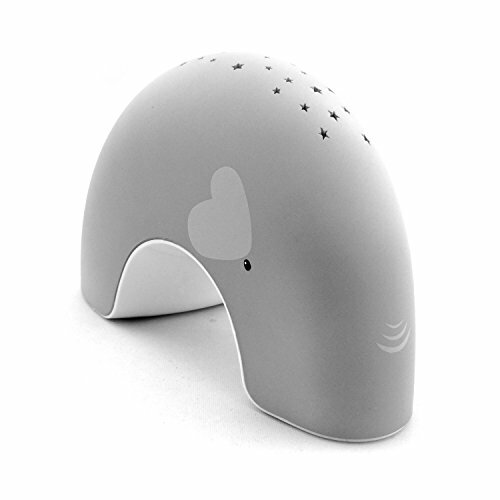 Warmly soothing rendition of Lullaby plays for either 10 or 20 minutes when activated. Starlight projection has a built-in 45 minute timer turns off the lamp. 3 x AAA batteries will last for 40 nights. If you have any questions about this product by Lumitusi, contact us by completing and submitting the form below. If you are looking for a specif part number, please include it with your message. Hammacher Schlemmer Cloub B The Award Winning Infant's Sleep Sound Lamb 10.5"